Project obstacles and solutions: The Wildcat Wind Farm consists of 125 windmills that generate enough energy to power 60,000 homes. 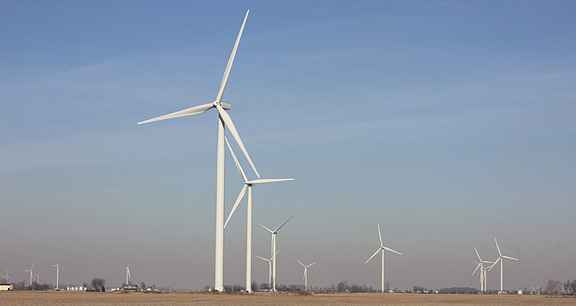 The construction site for these windmills encompassed 15,000 acres of farmland - over 23 square miles - across two counties. On a construction site this large and comprehensive, there are multiple issues and obstacles to overcome. Scheduling and meeting deadlines, achieving quality standards, operating within safety regulations, and transporting large equipment over approved roadways were some of the major obstacles on this particular site. White Construction was awarded the contract to design and build the 125 wind turbine foundations, erect the turbines and build a substation. Included in this contract was the construction of 53 miles of access roads across the rural area, modifying the existing roads to support construction traffic, and restoring the site so it could be farmed once again after the construction was complete. Due to expiring tax incentives, all 125 turbines had to be functional prior to 6 p.m. EST on December 31, 2012. The first shovel of dirt was turned in November 2011. IMI Concrete set up a portable plant at their Pipe Creek, Jr. location just north of the construction site. IMI also had two back up batch plants: at Marion, Indiana for the northeastern part of the project and Tipton, Indiana for the western part of the project. White was given very short notice from the turbine manufacturer when delivery would take place. Many times, these deliveries would happen weeks before they were scheduled. To leave the turbines on the delivery trucks, parked on the construction site, was costly; so many of the foundations had to be completed on short notice. IMI supplied 60,000 yards of concrete for the project. Each foundation consisted of 418 yards of concrete and another 30 yards were used as mud mats. The engineering specifications for the foundations required 5,000 psi concrete and limited its core temperature to a maximum of 160 degrees F. However, White needed a concrete that would gain early strength and could be backfilled as soon as three days. Quality requirements and time restrictions were in conflict with each other. IMI Technical Services went to work on a concrete mix that would not only meet ultimate strength and temperature specs, but would also accomplish 60% strength gain in as early as 24 hours to meet White’s backfill needs. IMI Technical Services used a chiller to lower batch water temperature, watered and shaded all of their aggregate stockpiles, and increased their cementitous material inventory to allow for a cooling period. IMI personnel were on site to monitor the concrete at each pour. Not only did the concrete meet all of these requirements, IMI was able to increase production and dedicate a fleet of trucks to delivery. White was able to pour an average of 2-3 foundations per day – up to 135 truckloads of concrete - and backfill them 24-72 hours after the pour. Safety is always a concern on any job site, particularly one of this magnitude. It is often seen as more of a hindrance than help, but unsafe conditions actually cause more delays if there is an incident. All of the Irving Materials divisions received high safety marks during the yearlong construction process, with no incidents. The safety procedures used by the group were the result of a well thought through collaborative effort. Staging areas were set up outside of the site to allow drivers to restock and refresh before entering the construction zones. All personnel were informed of the rules governing the work site: from proper placement of vehicles to the use of personal protection gear. “We were very pleased with the work that Irving Materials did for us. They really understand the entire construction process and they are excellent at what they do,” stated Mike Behringer, assistant project manager with White Construction. The Wildcat Wind Farm opened for business in October 2012. For more information on the Irving Materials group of companies, click here.